Hal Missingham often holidayed at his beach house at Garie in the Royal National Park south of Sydney, not far from Cronulla. In 1970 he published ‘Close focus’ a book of photographic details of rocks, pools, sand and driftwood. As a beachcomber and observer of beach culture Missingham delighted in his immediate environment. ‘Surf carnival, Cronulla’ is a quintessential Australian scene, one that frames an important aspect of national identity and culture. 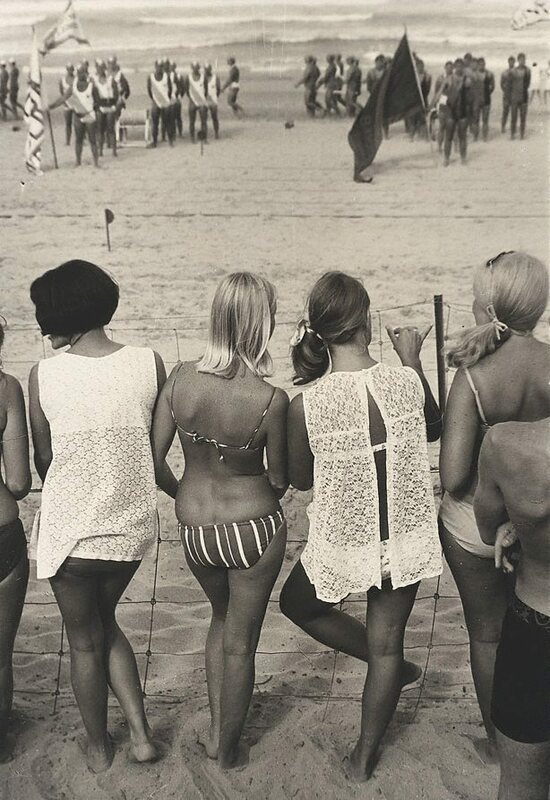 As passive observers, the 1960s was a time when many girls were still ‘minding the towels’ for the boys who surfed or competed in carnivals. Barricaded from the beach and its male activity the young women in bikinis are oblivious to the photographer who has foregrounded their relaxed tanned bodies behind the wire as they in turn observe and discuss the surf lifesavers in formation at the water’s edge. Although a beach is accessible for the majority of Australians and is now an accepted egalitarian space where women bodysurf, ride surfboards and compete along with beachgoers from diverse ethnic backgrounds, 'Surf carnival, Cronulla’ suggests a specific demography. Rose Peel, Photography: Art Gallery of New South Wales Collection , 'Australian postwar photo-documentary', pg.189-207, Sydney, 2007, 188 (illus. ), 205 (illus. ).